These are reviews of some books that we read that are worthy of mention. Dispatches is the fourth book in the Perseid Collapse series of post apocalyptic books by Steven Konkoly. Dispatches is broken up into two parts, The Big Picture, which gives the reader an insight into world politics without the presence of the US ground troops. We get reports from the Russian invasion of Estonia and the ISIS recruitment of jihadists near Mosul. The first part is a terrifying read throughout and gives terrific insight into what the world would look like if the US retracted it’s armed forces to deal with a massive internal problem. Part two of this novel, The Little Picture, deals with our friends in Maine. The Fletchers have relocated to Belgrade, Maine. Alex, the protagonist, is beginning to worry about the status of their food supply for their 19 member group. Meanwhile, the Governor of Maine refuses to recognize the Regional Recovery Zone and hostile actions intensify as a result of her decision. Her actions result in a military coup, lots of deaths, and a white knuckled ride in a SUV as Alex tries to return home to his family. During the whole ordeal his son, Ryan, steps up big-time and plays a more prominent role in this book. 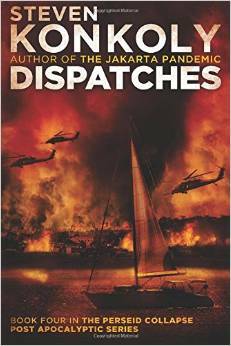 Dispatches is one of those non-stop action books that you will read quickly once you pick it up. Steven Konkoly’s writing is powerful and he wastes no words in telling this tale. I felt closure with this book and it was a very exciting finale in the Perseid Collapse series. Luckily this is not the last entry in the Perseid Collapse collection. Many gifted writers have written novelas in the Perseid Collapse World and their works can be viewed here. I look forward to reading them all. This entry was posted in Book Reviews and tagged Dispatches, The Jakarta Pandemic, The Perseid Collapse on April 3, 2015 by GunGuy. 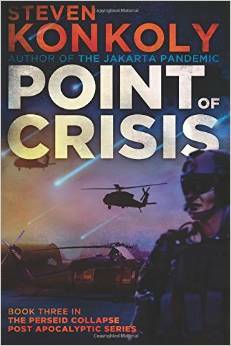 Point of Crisis is the third book in the Perseid Collapse series of post apocalyptic books by Steven Konkoly. Point of Crisis has a very different tone than the earlier books in the series. The Jakarta Pandemic and the first two books in this series are fantastic in that they mix an apocalyptic scenario with human drama and military style combat very well. This book seems to have dropped the human drama in favor of a military government take over of New England. Point of Crisis is not about Alex Fletcher and his family. This book is about Captain Fletcher and his almost superhuman abilities as a Military Intelligence Officer working against an evil insurgent and blundering bureaucratic leaders. At times he’s an invincible character without flaws or weaknesses single handedly saving all of Maine from the forces of darkness. This should had been another five star book following the super job the author did with the first two in this series. Point of Crisis is still a great action packed, intelligent, well-scripted story but this book took the story away from the focus on Alex’s family and their survival and more towards a criminal militia group and it’s leader Eli. Long chapters were devoted to cover the inner workings of this criminal militia leader which distracted from the focus of the two previous books. Overall it was a very well written solid book and I enjoyed it. I’m looking forward to Dispatches which is the last book in the Perseid Collapse series and is next up on my reading list. This entry was posted in Book Reviews and tagged Point of Crisis, The Jakarta Pandemic, The Perseid Collapse on April 1, 2015 by GunGuy. 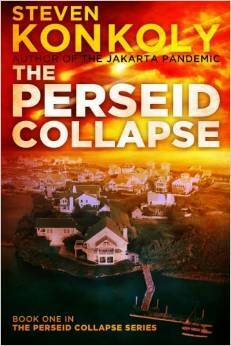 The Perseid Collapse is the first book in the Perseid Collapse series of post apocalyptic books by Steven Konkoly. 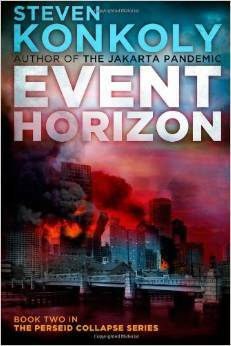 The Jakarta Pandemic was the prequel to this series and introduced us to all of the main charachters. The book was a fast read as the action flowed quickly and the characters were further developed and fleshed out. I liked how the book went into detail about how quickly civility starts to go out the window after the collective memories of the experiences during The Jakarta Pandemic kicks in. Throughout the book I enjoyed the descriptions of the protagonists friends and family and their interactions. They are written as believable characters who are very prepared and are either scared senseless or tactically proficient. Yet they still have moments when they want to curl up and hide, and instead step forward to do what they have to, even when that means accepting their own weakness or taking on a new role for the good of the group. They aren’t perfect but they are fiercely devoted to each other and they just keep going. If you’re a prep minded, the moments when the characters discover they’ve made a bad gear choice or forgotten some small thing with critical results will make you reconsider your own plans. I don’t want to give any spoilers but I did find Mr. Konkoly’s approach to the militia issue to be very refreshing since he gives the reader a view of both the positive and negative aspects. The contrast between the two groups is telling and makes for exciting reading. I highly recommend The Perseid Collapse for anyone looking for a fast paced, action-oriented thriller that will make you wonder what you would do if the lights went out. My only gripe with it is that it ends at a critical moment in the plot. I hate having to wait to find out what happens next. Luckily the next book in the series, Event Horizon, is out and next up on my reading list. This entry was posted in Book Reviews and tagged Steven Konkoly, The Jakarta Pandemic, The Perseid Collapse on March 25, 2015 by GunGuy. 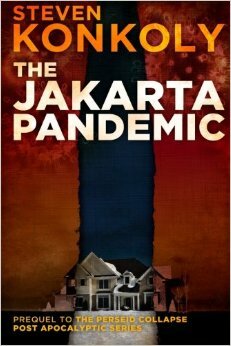 The Jakarta Pandemic by Steven Konkoly is a fantastic Post Apocalyptic novel and I would rate this as one of my favorites. A new strain of the H1 influenza virus starts spreading like wildfire across the globe with the death toll building at an alarming rate. Alex the contemporary upper-middle-class american protagonist, his wife Kate and their two young children live in a four-bedroom, two-and-a-half bath colonial-style home of recent vintage in a subdivision in southern Maine full of doctors and lawyers and business executives. The story follows Alex: a pharmaceutical sales rep who loves his wife and kids and who is slightly disgusted with his job. So far, so normal. Alex, however, is also ex-military with some guns and lots of supplies in the basement and just enough salt to co-opt his employer’s flu vaccine samples for those in need when the pandemic hits Maine. We’ve all dreamed of the perfect exit from a demeaning job and Alex’s coup de grace does not disappoint. What follows is a fascinating account of the disintegration of a suburban neighborhood as a deadly influenza descends. Lack of food and water quickly become more threatening than the virus itself. The scenes of denial and desperation among Alex and Kate’s neighbors are particularly well done, and the build-up to the inevitable deadly show-down is intense and absorbing. The author did his homework on both the influenza virus’s history and what it take to be prepared for long term emergency situations. While the Jakarta Pandemic can be deadly serious, it also can make you laugh with the banter between husband and wife and the ribbing between good friends. There are thrillers out there from more well known authors for three times this price and they don’t come close to the story telling here. If you are not a prepper or for that matter even if you are, pay attention as you may learn a few things in this book that could help you make the best of an emergency situation. You cannot go wrong buying this book. I cannot wait to read the next installment of this story: The Perseid Collapse. This entry was posted in Book Reviews and tagged post apocalyptic fiction, Steven Konkoly, The Jakarta Pandemic on March 18, 2015 by GunGuy.